Unfortunately, scammers to do not take off for the holiday season. In fact, it appears the scams increase! Last week a scam surfaced around the country. A number of bomb scares were reported requesting a bit coin payment. Since none of the “bomb” were detonated, this appears to have been just a scam. Bomb scares are not the only scams during the season. Just in the last few days I received a phone call from someone that reported they were receiving information about my business computer having problems. I was too busy to play with them, so I did the right thing and just hung up. Other companies that you have no relationship with are not getting information about your computer. Also, with tax season being just around the corner, the IRS does not notify you of any tax problems with a phone call. They ALWAYS send a letter in the US mail. The only institutions that may call, email or text you are your bank and credit card companies. Normally you will only receive these notifications if you sign up for them. Just to be extra cautious, do not reply to the notification, but call your bank or credit card company via the number on your statement or their website. If it is a legitimate concern, they will forward you to the correct person to resolve your issue. Again, if you get an unsolicited phone call about any computer issues, just hang up. The same goes for tax issues. If you get a strange pop up on your computer, shut it down immediately. If it will not let up shut down your computer, unplug it! and contact your IT department or a computer professional. Unfortunately, the holiday season is a busy time for scammers. Don’t let the business of the season allow you to let down your guard. Happy Holidays and be careful! Most software companies will support old versions of their software for a limited amount of time. Sage, our main vendor, only supports two prior versions of their software for Sage 300. A new version of Sage 300 comes out just about every year. This is not uncommon as most software vendors have a similar policy. Therefore, when Sage releases the 2019 version they will soon thereafter discontinue support for the 2016 version. Old unsupported versions will most likely still work fine in the short term, but they come with a risk. Recently one of our clients was hit by a virus. Fortunately they have good backups and were able to mitigate the damage. They decided to update their server and all of their workstations. Support for their accounting software had stopped a few years back due to changes by Microsoft. When they installed all the new hardware they encountered a number of issues with the old software. They now are facing an unplanned upgrade. They were perfectly happy with the old software, but there is always the risk that it will not run properly with new hardware. Now we do not recommend that you always have to upgrade to the latest version and we continue to support old software even when it no longer supported by the vendor, but we are limited in what we can do. Technology changes quickly and we do not want to hold a company back from using newer, faster and easier computer equipment and software, because they have an old accounting or ERP system. If you are currently using unsupported software we recommend replacing it as soon as possible. Definitely within the next year or two. What you will find out when purchasing a new system is that many software companies are moving to a selling on a subscription basis. This will significantly reduce the first year cost of the software, but future years many have a larger cost. This is the way that Sage now sells most of its products and it is the way they sell Sage 300. Interestingly, the future yearly subscription price is about the same as the old annual maintenance fee. There is an activation fee in the first year and of course the cost of setting up the software, moving data and training users. We have not found a client that would pay more under the new pricing plan than if they were to purchase the software under the old method and keep paying for their annual maintenance. The moral of the story is you can either plan to upgrade your software or wait for a disaster and be forced to upgrade. We prefer working planned updates. It is less stressful for you and easier too! I want to thank Joseph F Bigane, III, CPA, MST for the following article on the resent supreme court rules on sales taxes. Joe is one of the most knowledgeable person on this topic and he wrote this article for particularly for small businesses. On June 21, 2018 the world of collecting sales tax in jurisdictions all over the United States changed forever. The US Supreme Court held that it was no longer required that a seller must have a physical presence in a jurisdiction in order for that state (or subdivision thereof) to impose an obligation on sellers to collect the jurisdiction’s sales tax. The dust has not yet settled and many jurisdictions are still determining how and when they will impose this duty. Further, different states have different taxes, which for this article will all be referred to as “sales tax.” Finally, the rules of South Dakota, the state in the Wayfair case, established a floor of $100,000 or more than 199 transactions in the prior year as the minimum activity in the state in order for the duty to collect to be imposed. Other states may have different minimums but it is anticipated that they will not be smaller. Unfortunately, the states do not at this time have a common set of laws stating what is and what is not taxable or exempt. So, sales into one state may be taxed while sales into a different state may not. Some states tax most services (SD, NM) while other states have a list of “enumerated services” which they tax. Here, too, there may be wide differences in the definition of what a service does or does not entail. If you sell or license software you will need to determine if the state considers it canned or custom or both. While there is no fifty state determination at this point, nor is there any serious indication that the federal Congress will intervene to provide a national solution, there are many states which are setting up their rules to be applicable as of October 1, 2018 or January 1, 2019. So, you do not have the luxury of putting this issue off. Collecting sales tax is an administrative burden but the money is collected from your customer and does not come out of your bottom line. If you fail to properly collect and remit taxes, and the state(s) ultimately find and audit you, then the money (tax, penalties and interest) will come out of your bottom line. So now is the time to talk to your professionals and determine in what states you will have to register as a tax collector and how you will determine the amount of tax you will need to collect for each transaction. While a certain number of states are members of the Streamlined Sales Tax Agreement and can provide a simplified method for registering and filing, it may still be necessary for you to invest in sales tax software to determine the correct amount to charge for each transaction. Measuring Success…What do you Measure? Every so often I decide that I need to get my diet under control. The first thing I do is start recording what I eat in a food diary. Why? Because our goals are more achievable when we measure the steps that get us there. Over the next month or so let’s look at some ways we can measure our HR and Payroll performance. EARLY TURNOVER: This looks at the number of recruits leaving in their first year divided by the number of recruits hired in the period. REGRETTED LOSS: Regrettable turnover is when an employee’s departure from a company has a negative impact on the team or organization. The measurement is the number of employees who left the company but who the company had planned to retain divided by the total number of terminations. NON-REGRETTABLE TERMINATION RATE: Employees who left the company, but their leaving had no appreciable effect on the company. CONTROLLABLE SEPARATION RATE: Employees who left for a reason that the company might have been able to address if they had been aware of it. UNCONTROLLABLE SEPARATION RATE: Employees who left for a reason that the company could not possibly control, even if they had been aware. This measurement would include death, military service, plant closure, etc. Some of these statistics are readily available. Others may require you to review the way you currently classify the terminations in your HR System. Once you start tracking them, however, you will be able to see where you need to focus your attention. http://www.wacsolutionpartners.com/wp-content/uploads/2013/07/wacsp.png 0 0 Arlie Skory http://www.wacsolutionpartners.com/wp-content/uploads/2013/07/wacsp.png Arlie Skory2018-07-06 17:34:362018-07-06 17:34:36Measuring Success...What do you Measure? This past February was the Third-Party Advantage Conference (TPAC) held in Vancouver, British Colombia, Canada. I had the opportunity to visit this beautiful city and participate in the conference that brings together a great group of products and people on the Sage 300 ERP platform. Sage Business Partners, Development Partners, and customers from all over the globe were in attendance to discover what products are available on the market to enhance an end user’s Sage 300 experience. I was in Vancouver the week before TPAC to attend a pre-conference training session for AutoSimply, one of the featured third-party exhibitors at the conference. The two-day training session discussed how to utilize the Manufacturing Order Module (version 2018) within Sage 300. The Manufacturing Order Module allows end users to create Bills Of Material (BOMs), manufacturing order entries, returns, and receipts. Other modules that were discussed, which can be added to Sage 300 in addition to the Manufacturing Order Module, includes Manufacturing Lots for lot control operations; Production Planning for budgeting and forecasting; and Shop Floor Control for tracking manufacturing operations such as runtime and operation downtime. AutoSimply also discussed their Inventory Barcode Manufacturing product which allows end users to scan compatible barcodes and automatically upload the information to their Sage 300 ERP. End users can also create Purchase Order (PO) Receipts, PO Returns, Order Entry (OE) Shipments and OE Returns from their handheld barcode scanning device. At the end of the two-day AutoSimply training session, I was awarded a Certificate of Completion from AutoSimply. I also attended a conference session regarding new features coming to the next version of Sage Alerts & Workflow led by Donald Farber of Vineyardsoft, a developer of the product. The next version of Sage Alerts & Workflow will be web based for convenient user access along with modern web screen designs. Sage Alerts & Workflow is a query reporting software that notifies end users of events that users without Sage Alerts could only “wish they had known sooner.” These events include lists of: customers with open invoices due over ‘x’ days ago; customers whose credit cards expire next month; open sales orders that have not been shipped yet and are past the expected ship date; orders that have been shipped to the customer but have not been invoiced, etc. These reports can be set to automatically run on certain time intervals such as “Daily at 9am” or “Every 4th Friday of the Month,” and sent via email, text, or fax to persons of different departments and management levels internally and externally according to a business’ needs. Sage Alerts & Workflow is a great tool for users to keep track of their business from all angles. Overall, TPAC 2018 was a successful and enlightening event to attend, to forge new relationships and learn about different products that operate alongside Sage 300. I look forward to attending again next year! As providers of accounting software, implementation and support, we offer a wide range of solutions designed to fit businesses and non-profits of all sizes. Our combination of products and services allow you to better manage your accounting and to make insightful decisions about your company’s future. This is a success story about a very fun customer Mervin Manufacturing that we began working with in 1989. It was a great partnership. Mervin Manufacturing is home to Lib Tech, GNU, Roxy and Bent Metal Bindings and is a leading designer and manufacture of snowboarding products. We began working with Mervin Manufacturing in 1989 when they were just a 10-year-old company. They were looking for a partner to help them grow their business to the next level. Our company provides small business bookkeeping services as well as Accounting Software system sales, implementation, support and training. They originally called us because we were close to their Seattle office, initially it was a box of checks. The project was to reconcile their bank accounts and do monthly financial statements for them, we did all the accounting on our system. We also did their accounts payable and payroll. As the company grew further they asked us to provide an in-house accounting system and computer network system. We sourced an IT company for the computers and sold them Sage 100 (Formally MAS 90). Their original customer base was on an Apple Macintosh that we helped them bring over to the new Sage 100 (Formally MAS 90) system. This was a phased in training and implementation, first the financial modules including General Ledger, Accounts Payable, Accounts Receivable and Payroll. And then the distribution modules which included Inventory, Sales Order and Purchase Order. We trained the customer staff from the ground up as they had never had much experience with Sage 100 (Formally MAS 90) or other accounting systems. Upon completion of the Software Implementation we continuing as their outsourced accounting company. We provided monthly financial statements, did their payroll for them, closed all the accounting and distribution modules monthly. We remained their accounting company for over 10 years. Eventually Mervin Manufacturing was sold to Quiksilver and in recent years the company was repurchased and now operates as an independent standalone company under Altamont. They are home to many snowboard enthusiasts and many Olympic snowboard athletes. Welcome to part two of WAC Solution Partners’ series on closing periods! Today we will cover how to reopen and edit accounting period. What is reopening a closed period and why would you want to do it? In NetSuite, when a period status is “Closed” no transactions can be posted to any date within the period by anyone (including administrators). There are times when you find a transaction that was overlooked or there is a transaction that your accountant recommends entering in a previous period or fiscal year. If these periods are closed you must reopen them. Here is how to reopen an accounting period. b. The Manage Accounting Periods page allows you to close and open periods or to set up new fiscal calendars. Closed periods will be marked with a green check under “Period Close” and will indicate that AP, AR, and GL are all locked. c. Click the checklist button of the period you would like to reopen. e. From here you can click the “Reopen Period” button. Note that the system will ask you for a justification for reopening the period. Fill in your reason. f. The system will also require that you reopen all periods after the one you are opening, though they will remain locked. You will also have to go through the checklist again. In the example below, July 2013 was opened for editing. As you can see, all subsequent periods were opened, but they remain locked. h. …and unmark the items which were marked for locking. j. Depending which checklist item you unlock first, items which were dependent upon it may become unlocked as well. k. All periods after the unlocked period will also become unlocked. You may now make your changes. l. To re-close the edited period, repeat the closing steps described in part one of this blog. 2. You may be wondering whether you have to go through the checklist all over again for each of the periods you opened. You do not. Because re-closing any open, intervening periods which did not need editing was a tedious chore, NetSuite created Quick Close. Because this feature can close any period, it is not recommended that you use it to close periods where the checklist was never followed. The feature merely marks items as locked and complete—it does not actually perform the closing tasks. a. To use this feature, go into your Manage Accounting Periods page. b. Click “Close Multiple Periods”. There is no button marked “Quick Close” at the time of writing. c. The system then asks you to select a period. Quick Close will close all periods dated before the one you select. The system will display this warning. Again, we do not recommend using this feature to close periods which were not closed properly by completing all items in the closing checklist. e. If you are sure, click “OK”. As you can see, NetSuite makes reopening and reclosing periods a fairly simple task and offers several tools with which to manage them. We hope that this blog was useful to you. If you have any questions about closing or reopening periods, the Quick Close routine or any other NetSuite topic, please contact us by Clicking Here! Sage 100 ERP consultant, we had a client who had a technical issue with Paperless Office hanging up. Do you know how to stop this from happening? NOTE: Consult with your certified Sage 100 ERP consultant before making any changes to your Sage 100 ERP system. Question: We are a Sage 100 user, we are using the Paperless Office and the printer hangs up forever. 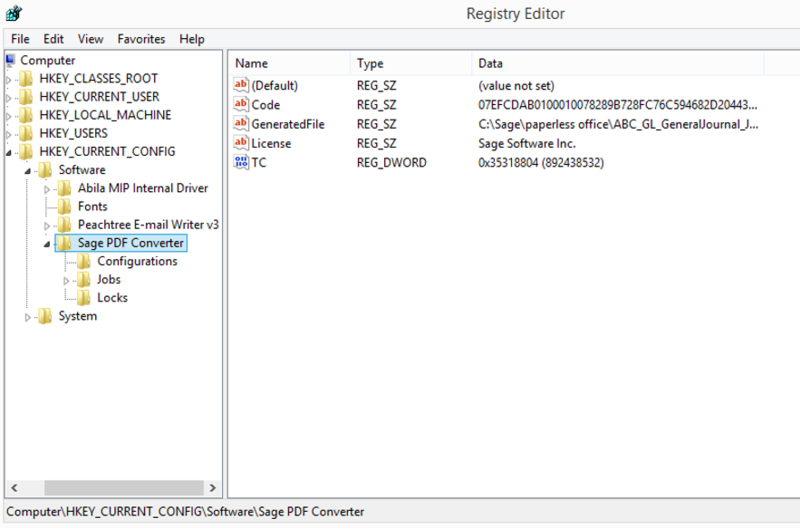 Click on: HKEY_CURRENT_CONFIG, Software, Sage PDF Converter, right click select permissions and set full rights to everyone. Apply and OK.
3) Uninstall Converter, then Install Converter. 4) De-install Workstation Setup and then Re-Installed Workstation and run Update. 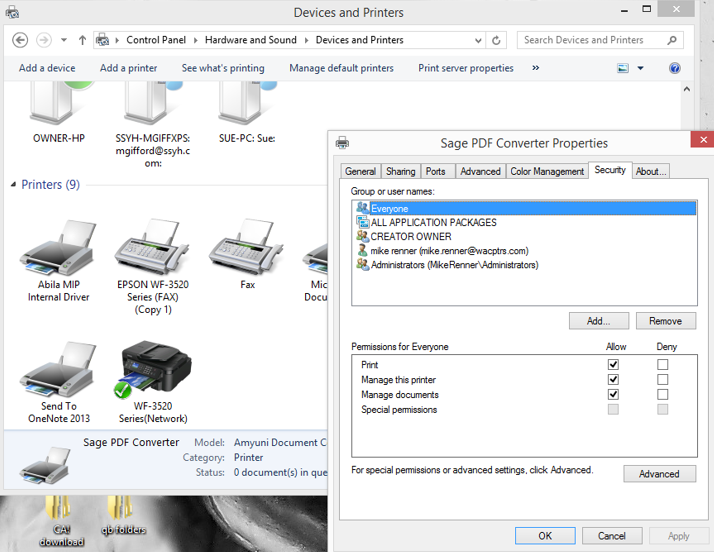 5) Find Sage PDF Converter from printer properties, install Sage port if not there, on the security tab set full permissions to everyone. Apply and OK.
6) Back to Sage 100, File Run PL_AdvancedOptions_UI and test Sage PDF printer. This should solve the problem in most cases, Paperless Office printing is done on a machine by machine basis so it is necessary to check these steps on each machine. If you have questions please contact us at www.caserv.com, email or 760-618-1395. Please stay tuned for more helpful Sage 100 ERP tips! Hello again from WAC Solution Partners! We are back with a two-part blog about closing accounting periods in NetSuite. In this first part, we will cover how to close a period, and in part two, we will cover how to reopen and edit a closed period. So what is closing a period and why would you want to do it? In most software packages, “closing” a period means roughly the same thing, but they do differ slightly. With some packages it may be a simple process, and in some packages it may be complex. In NetSuite, closing a period changes its status from “Open” to “Closed” and locks it so that no transactions can be posted to any date within the period by anyone (including administrators). It also prevents editing. For these reasons, closing a period should only be done after all posting to a period is complete. It should also only be performed after review and reconciliation to ensure correctness and balance. For some companies this is a simple procedure and for some it is complex. However, no matter what the size, closing in NetSuite is relatively simple compared to many other software packages. NetSuite gives you a “Period Close Checklist” to walk you through the closing procedure. Its contents are affected by what modules and features you have active in your system. For instance, Multi-Currency would add a step to the list regarding currency evaluation. 1. Let’s see how to close a period. b. The Manage Accounting Periods page allows you to close and open periods, or to set up new fiscal calendars. Closed periods will be marked with a green check under “Period Close” and will display a locked icon to indicate that AP, AR, and GL are all locked. Open periods will not have a check and transactions will appear unlocked. Because periods are closed sequentially, this means that any checked period before the latest checked period is closed. c. The first step in closing the period is to click on the checklist. d. This brings you to the checklist for that period. Please note that because we are using a demo environment and reopening previous periods for demonstration purposes, the status is listed as “Reopened”. e. Begin clicking through the items on the checklist. The first item, Lock A/R will bring you to this page. f. Check the boxes and hit “Submit” to save your work. This locks AR for the checked companies for the selected period. Note that our demo company has multiple subsidiaries. If you only have one entity in your system, you will only see that entity. g. You will be sent back to the checklist. A/R will now be marked as locked. h. You may then close the items listed before “Close” in any order you like. However, certain items may have prerequisites that need to be completed before they may be closed. These items are greyed out, and hovering over them with your cursor will tell you what needs to be done in order to close them. i. Lock All” is a misnomer, as it actually means the GL. j. “Resolve Date/Period Mismatches” allows you to correct transactions that are dated wrong. For instance, if an invoice is posted to the wrong month. Clicking this will cause NetSuite to look for mismatches in the transactions for the period. You can then click the Edit links to resolve these discrepancies. k. Note that when you create transactions, those transactions will not automatically post to the proper period if that period is not set up in a fiscal calendar. This means that if you are trying to post in 2018 but have not created any 2018 periods in NetSuite, then the transactions will post in the wrong period. l. The final step is to click “Close” at the end. m. After this, click “Close Period”. n. The period is now closed. o. If you go back to the main list, you will see the closure reflected there, as well. As you can see, NetSuite makes closing periods a fairly simple task and offers several tools with which to manage them. Please read our next blog on reopening accounting periods and the use of the “Quick Close” routine. We hope that this blog was useful to you. If you have any questions about closing periods or any other NetSuite topic, please contact us by Clicking Here! By now we are all aware that there are new tax tables coming due to tax reform. While most everyone will see a difference in their paycheck by February 15, there are still some details that aren’t quite ready. As the tax law is written, there will be no personal exemptions for 2018. So, what are we supposed to do with those W-4 forms that we have from our employees? based on treating the payee as a married individual claiming three withholding allowances. Basically, it is going to take the IRS quite some time to redesign the W-4 so it reflects the changes in the new tax law, so to minimize the burden on employees and employers, the IRS and the Treasury Department designed the 2018 withholding tables to work with the Forms W-4 that employees have already furnished their employers. Once the newly designed 2018 Form W-4 is released employees will have 30 days to submit the new forms to their employers.